Adventure, our Lagoon 450 SporTop (2017), gives a whole new meaning to the idea of comfort, with a new elegant line and increased performance under sail. Designed with a mid-height helm station instead of a fly-bridge, the SporTop enables the helmsman to easily socialize with the rest of the crew. The helm station is well-protected from the elements and the roof provides a large sunbathing area – a perfect place to soak up the sunshine. No flybridge means that the boom is lowered, stability is gained and working with the mainsail is simplified which is appreciated when sailing short handed. 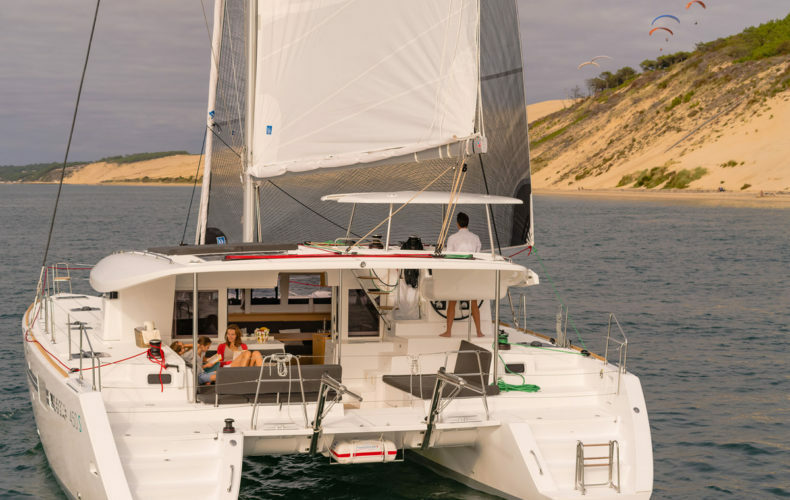 Adventure is equipped with all electric winches for sails and davits, full electronics and a convenient chain counter. 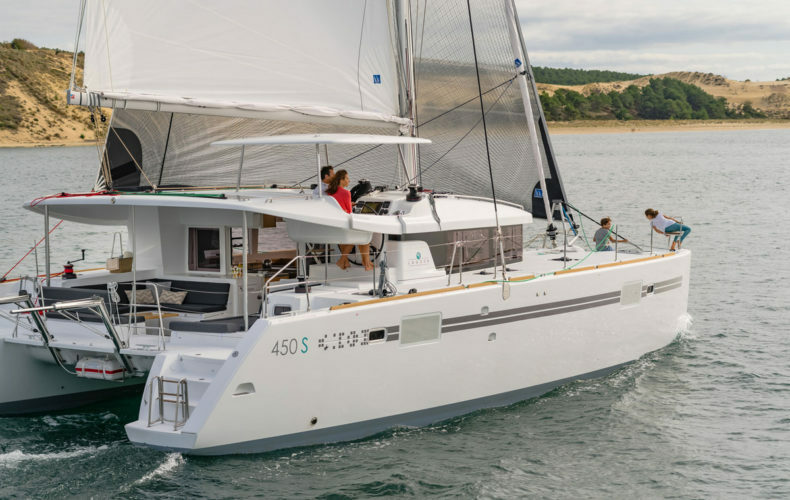 The Lagoon 450 SporTop is a great choice for sailing with a small or large crew. The main or owners stateroom, which spans the entire starboard hull, is essentially a dedicated apartment that can be closed off from the rest of the yacht for privacy. It’s complete with a huge aft berth, a small office, a large en suite head with separate shower compartment, and oodles of closet and storage space. The saloon and cabins are exceptionally well lit and there is a good amount of natural light in the cabins due to fixed windows in the hull. All beds are queen size and the ensuite bathrooms have a separate shower. A single cabin is located forward. SAILING PHOTOS ON THIS PAGE ARE STOCK PHOTOS COURTESY OF LAGOON AND DO NOT DEPICT ADVENTURE HERSELF. WE WILL HAVE PHOTOGRAPHS OF ADVENTURE AS SOON AS SHE ARRIVES IN THE BVI.